This is me at Dreamforce. My name is David Liu and this is my story! A few years ago, I worked in marketing and couldn’t write a single line of code. Since then, I’ve become a Technical Architect, where I build funny things like Salesforce apps, integrations, and APIs. Nowadays, I’m a Salesforce Technical Architect at Google. It wasn’t easy to learn Apex, Salesforce’s proprietary programming language, but it should have been. There was plenty of documentation online, but they were all catered towards people who already knew how to code. I needed a website to help point me in the right direction – but that site didn’t exist! That’s why I’m building SFDC99! I want to help you, the non-coding admin, so you don’t have to go through the same needless struggles that I went through when I began. It’ll still be a challenge, but now you’ll have a teacher to help guide you through your way. I’m a five-time Salesforce MVP! I’m the inaugural Salesforce Developer “Golden Hoodie” award winner! Jason Venable, Salesforce.com MVP and my inspiration when learning to code. Steven Herod, Salesforce.com MVP with every Salesforce certification – my hero! Dan Appleman, Salesforce.com MVP who literally wrote the book on Apex! Shoot me a message on Twitter! Thank you for sharing this useful information! I recently passed ADM-201, but I do not have hands-on experience with Salesforce. Where and how do I start? What do you recommend? I was looking for some volunteering opportunities, to help some NGO and gain some hands-on salesforce experience at the same time, but was not able to find any information while searching on internet. Could you please point me to some resources or guide me how to go about it? Thanks in advance for your help! Thank you for sharing the website online. I have gone through the content and videos very inspiring. I want to learn coding and want to become sales force developer and I am financially very weak and my Father is cancer patient and I cannot afford financially any courses online, kindly help me if you can. Please tell me what I need to learn I do have little knowledge on programming but not at expertise level, I request and beg you please help me to become success full sales force developer and put my 100% efforts. Good luck to your dad and you. Congrats on your golden hoodie.. That is so great. Thank-you for the inspiration. I am trying to reach you since long but no use. I am taking the course in Pluralsight and I am stuck in Triggers. ‘write a trigger that alerts you if your case contains sensitive information ‘, I coded the same way you guided but it doesn’t create the child case on the case object when I am testing to create case with description sensitive keywords. Please let me know the reason, following is my code? Review your code and rewatch PluralSight course. I am a shareholder of CRM for sometime. Thanks. I am retired but I have a daughter that’s unhappy and looking for a position with CRM or Google. She has been in retail since 1977. Her last position was a DM for one of the largest retail stores with about 3000 employees under her. She made a switch to health care in early 2017 and is a Senior HR for four hospitals but admits the culture is just not her and she wants to start looking at other opportunities. Could you guide me to the right people for her to send a resume? That would be Great! Thanks for the inspiring post. I am glad I visited your website. I am looking to get certified in Salesforce to revitalize my career but don’t know where to start even after spending so much time reading all the posts. Please ignore the duplicate message. Thanks in advance. Keep up the good work going. Bless you. Hi David, thank you so much for your reply. I have started preparing for Administrator as you guided in the link. To start with, I am planning for – Administrator, Service Cloud. I hope this should be good to move further and make a switch to Salesforce industry. Thank you for your time efforts you have put it here. Could you provide table of contents for learning Salesforce Development. I mean step by step topics and sub-topics to go through in an order to learn SF development. Go to the beginner tutorials tab on this site. Hi David – I have been working in Salesforce Industry for some time as Consultant and Admin . I am inspired by your post and want to learn the programing side of Salesforce . OR is there any way to enroll for any other classes which you are planning to take in future. I am new to Salesforce and I want to express my gratitude to you for such a great website. Please suggest me how should I proceed to grasp more in less time. Also , I would request you to help us with a way to get challenges in apex so that our interest increases with time. If there is any link for practice tasks , please let me know. I can’t properly express how grateful I am for what you are doing here. You are a true inspiration, and may very well be a component in saving my life. Many, many thanks. Thank you Christopher, you made my day! I am your follower and your remote salesforce student. I follow you as I follow my Holy Bible. I came with a request as I am not very fluent with codes but I want to take PD1 certification. Without certification and experience its impossible to get a job in India. No body gives a chance to freshers to work and learn, I am ready to work for free but not getting chance anywhere. I request you here to provide the steps how to prepare for pd1 and crack it coz it is very costly exam for me I can only afford it once…. hahaha, thank you Angie! Quizlet flashcards are the way to go!! I just wanted to say: God Bless You! You seems genuinely a very nice person. You have positively impacted a lot of people and you should be proud of yourself. But most importantly, please, go and kiss the hands of the people who raised you well; you are a continuation of them! That is a very nice thing to say, thank you Muhammad!!! Amen, I owe everything to my family!!! I have been following your blog since last year. Now, I have 4 certification (Admin, Advance Admin, Sales and Service) and working at a Non profit Organization as a Volunteer. Applying for Job but still no calls. Any suggestions ? I have Bachelor in computer information and 4 years work gap working in a different entrepreneural project which did not work out. Your resume probably needs work! There are multiple sources saying what Ideal resume should be. Some says it should not be more than 1 or 2 page but when I see all Salesforce sample resume on Indeed its 4 to 5 pages with same thing repeating. I know you get lot of resume so, I don’t want to ask you to check mine but besides that any other suggestions or sites I can refer to ? 1 page =) My resume is only 1 page too! 1 page, Nice! I managed to make my resume 2 page. Let’s see how it goes. Hey David, Do you plan to Post anything about Integration ? May be an Intro would be good. I have a very basic knowledge of coding. I was demotivated as I left my job and I was confused which bus to catch and a frnd introduced me to SF. Initially I was scared to start but after reading the success stories, I am motivated to an extent. I want to jump in.. I want to learn SF from the scratch. Please help me know from where should I start and catch the bus. If new application is created with application type: New| Renewal pancard is a must. Hi, I am Dibakar, working in a marketing team. We are looking for a salesforce influencer, who is technically strong and engaged in real paid reviews on salesforce related third party products. Hi David, My bro suggested me about your website. Currently i am working as java developer. I really want to jump into salesforce. I look forward to have a great experience with this site. Thank you for providing the way to learn the salesforce through your website. Your bro is a good man! Can you please mention the topics that i can go through serially to avoid being jumped from one topic to another. I have started the salesforce study, but really I am unable to catch up the topics.Please guide me as its really confusing. thank you. I’m 29 and I’m currently in the middle of a career change. I’ll be in coding school until next year to learn Java :) The cool thing is I’ve already been hired in an IT company specialized in Salesforce. I didn’t even know about all the great things Salesforce can do. I leave this message today as a promise to myself and to you to become a certified salesforce developer and to give the best of myself to this new adventure ! I’ve actually begin the admin beginner module today, since I want to understand the admin side of Salesforce as much as the coding side. When I see what you’ve been able to do in such a short amount of time it really motivates me ! Your site and Trailhead will become my favorite site in the months(and even years) to come :) Thank you so much for the motivation ! Wow! Thank you for sharing Tiphanie, you’ve got a great thing going for ya!! With that attitude you’ll go far, keep it up! I am a SAP Technical Consultant working in India.I have around 12 years experience in SAP. One of my friends had mentioned your website in one of his posts in facebook and I had the chance to go through the same. I am very impressed and have become a fan of yours. I would like to move from SAP to salesforce. Will this switch be easy given that I have no idea about salesforce but i have programming knowledge. Would it make sense to jump into salesforce after 12 years in SAP ABAP. Is there any way to get the list dynamically… ? I tried using Alias to it wasnt working. Can you please help me out. ? Thank you Rakesh! Well at that point I’d recommend the Apex Academy really! How to define Campaign & how it can be automated. Will you be speaking again at Dreamforce this year? I wasn’t sure if you announced anything yet.. or maybe I missed something. I might do one small session with Pluralsight, otherwise taking it easy this year! Usually every other year I take off =) Hopefully this same time next year I’ll be presenting on how to become a certified technical architect! I have a question regarding to getting to Salesforce Setup on Salesforce Development environment. On my environment, I do not see the Trigger Editor (Apex Trigger) under Customize-Leads-Triggers. Mine does not look like yours instruction demo on PluralSight. Do I get into wrong page? Please review attachment and advice. David, I just recently started the Apex Academy course in Pluralsight. Just found out that MavensMate is no longer available. Do you recommend any other editors? I statred preparing for SFDC about an year back, took admin and app developer , and bagged a job as a consultant…thanks a lot David…i owe this to you, Pluralsight helped me a lot. This was the 1st step towards my aspiration for being an MVP and a keynote speaker some day. I was not coder but learnt some and somehow managed to get a job. This is not my dream company but certainly a good platform to strive towards my dream. I thought i would work for some time here learn coding and then try for my dream company but suddenly this dream company of mine started recruiting for salesforce and i received a call,i cleared 1st few rounds started dreaming my new career but got a setback when i got rejected in the final round. I felt devastated, i wasn’t able to sleep for nights, This was something i was waiting for 2 years and when i got an opportunity i lost it, i was in immense pain. This was the moment, when i opened sfdc99 and again went through your blog, motivated myself with the success stories, sunk in the pain of rejection and fastened my seat belt for a flight towards a career where i do not hunt for jobs the employers hunt me. With the determination of becoming an excellent programmer i have restarted my journey. Wish me luck for my journey. Fasten that seatbelt! You’ve got an amazing journey ahead =) Thank you for helping inspire me too! Question: Will Salesforce DX replace (so to say) all other IDE’s? Somewhat! I think it works best with the Force.com IDE, but it’s still early to say! I have a few years experience in .net development (c#). Will the transition to salesforce dev be straight forward? I hear mostly Java people move into salesforce. Won’t be an issue at all! I am new to Salesforce development and planning for Platform Developer I certification. I have already attempted it once but couldn’t succeed. I believe, no hands on experience might be the reason of not clearing the exam. Could you please help me with the right approach to get certified? Thanks for all the guidance. I am happy to share that I am now double certified with ADM 201 and PD-I. I am looking for some guidance on PD-II, but there is no one with PD-II in my office and there is little nothing i found on internet. It will be great if you can guide me on my journey to PD-II. Anything will be of great help. I have setup a virtual timeline of 3 months to myself but stupidly so did it without much info. Looking forward for continuous support. Hi David, I have completed my ADM 201 and PD-I certification. I am more intended towards programming and want to achieve the PD-II certification now. However there is little to no guidance(apologies if am wrong) on this certification. Can you please help me with some links or anything on how to prepare for this in 3 months time. PD-II is human graded, so you can’t study for it like other multiple choice exams. That’s also why it’s probably the highest sought after cert by employers! Worth the hard work, even if there aren’t many resources! Hi this is kashyashree I completed my MCA in 2009. And forgot all the subjects now. But now I am very much interested to learn salesforce. I don’t have any coding knowledge. Whether I am fit for this course or not. But I have confidence on me if I do had work I will succeed in any one. Now plz suggest me. Before entering to course what I have to know I.e basic knowledge on salesforce. And which institution is best for this course in Hyderabad. And plz advice me less pay institute coz my background is poor. Thank you very much. Try stopping by local non-profits! Hello, I am wanting to get to get certified and have no hands on experience what guidance can you provide? I am certified Salesforce Admin & App Builder and this blog has been my source of inspiration. Thanks and keep up the great work! Well, I am without a significant background in programming and eager to start leaning Apex. A good friend of mine told me to start with Java. Now my question is, should I start with Java or can I jump right into Apex? In the past I’d recommend Java, but mostly because there weren’t enough Apex resources to focus on that alone. Nowadays there are enough resources out there that you don’t need to learn Java as well, however, you can learn Java as a secondary supplement sort of thing! Hi David, I am deflated….just did the dev 401 exam, New version and not a single question from any of the quizlets was on it! I am despairing of passing this exam…. Are there any new app developer quizlets to study? Have re-taken the test yet? Hit me up on Linkedin and I’ll suggest what you can do within short period of time. I prepared within 1 month and I passed on first attempt with lots of time left when I’m about to submit. The goal of the quizlets isn’t to give you the test questions, or even similar questions with different names/numbers. The goal is to show you which areas you’re strong in and which areas you need to study more! I actually remove links to certain quizlets when I find they are too similar to actual certification questions. IMO that’s bad for everyone! My recommendation – mark all the questions you weren’t sure of (be extra paranoid) and make sure to study those areas after the test. Do this whether you think you’re going to pass or fail a cert! first thank you very much for all your help. The certification suggestions are great – you have made me want to do them! Could you please tell me what to do about the new dev 401 replacement – I think it’s called app builder? Any suggestions? Also the first quizlet does not seem to work on the adm 201 list. Any alternatives? Hope you are doing well!! Currently i am working as a testing specialist and having 4 years of experience and i want to learn sales force .Please guide me and will it be right decision to make a career switch from testing to sales force after 4 years ? I am done with my admin(201) and Platfrom dev I certifications .so i wanna write my next salesforce certifications but i am in a confusion either to write App Builder or Sales cloud consultant certification. So which one is better job opportunities. App builder no doubt! Unless you are looking for consultant jobs! I want to learn and work in Salesforce domain. I have just started my coding career with a small start-up, and prior to this I have ERP technical and functional support experience. As of now I am just going through some tutorials on cloud computing and I look forward to learn SFDC. I checked on a few institute regarding tutorials and training, but getting a job as a fresher in SFDC domain is pretty difficult here in INDIA. Can you please suggest me if it is right to proceed ahead and switch over to Salesforce. Try finding something local near you! Thanks David, started off with the point and click .. will soon start APEX. Does the course of “Admin beginner” in trailhead contains all the information required to clear the Admin 201 certification exam with confidence? The reason I ask, it felt pretty basic and not close to what Admins are actually doing. Just to Add, there is another “Admin Advanced” course, do I need to finish that as well for Admin 201 certification? If you finished the Trailhead then immediately took the ADM201 exam, you’d fail miserably! Check out my certs guide for more info why! What would you advice a Salesforce newbie to become, more of a technical or more of a developer? and why? Same thing if you ask me! Go dev! I’m just getting started in Salesforce! I just got my 201 cert. You’re site is an inspiration to me! I would like to post some of the training material on your site. Do you have place for it ? In my production org, it is showing as Unlimited edition. Our org is having 7 developer sandboxes. And when i try to see the edition of the developer sandbox, it is showing as Enterprise edition. Is it possible to have different editions for production and developer sandboxes? All over is awesome. But a question hits me. Why you want to be 99% not more or less? Sorry this may be an irrelevant question, but would like to know! hahaha – 1% of people have the talent to become a developer with very little guidance. This site is for the rest of the 99%! First of all, thanks for all the salesforce resources that you share in your webpage. They had be very useful for me, also your history is very inspiring for those (like me) who are beginning to work in salesforce. I would like to ask you if it is possible to put close captions in the tutorials videos that you made (and are making, specially the ine that you will be launch soon about apex programming intro). That would be great for those whose native languages are different from english. I’ve been purposely typing my scripts for this exact reason! PluralSight has a closed captioning option. I don’t know if it’s there for every video at launch but I’ll ask my editor to see! I am college dropout. I am Salesforce developer. I have clear salesforce developer certification. Hey David, I need a job. Please tell me any company who recruit Based upon talent. Every company will recruit based on talent of course! But it’s not enough to be talented – you also need to be able to showcase your talent in a short amount of time. IE your resume and your interviews. Luckily there’s no shortage of resources and time to get good at this. Definitely check out the careers sections on this site as well as glassdoor.com for interview samples! does google use salesforce ? i want to implement escalation matrix for leads and opportunities objects. A lead/opportunity should get escalate to higher authority if no action taken by sales person on it. there might be 3-4 levels of escalation till it reaches to highest authority. the escalation should stopped only when it’s status comes to won or lost. plz guide me how to achieve in salesforce. Wayyyyy too much to look at for me =) Try the Salesforce forums! Thanks David Liu for excellent site. I have started learning the salesforce and fortunately I have got into this site sdfc99.com and it is awesome .. so much of information at one place.The video of Adam Seligman had blown my mind. Thank you for your time and hardwork to setup and maintain this site. David – I’ve been searching for a long time for inspiration… you’ve done it! You’ve actually inspired me! Thank you so much for sharing your story – and offering your knowledge! I will forever be a fan and will remain grateful for the rest of my career!! I need a small clarification on SFDC developer…Is it require complete java or only core java. If only core java is required than what are the major portions we need to conceterate?? About half of Head First Java should be sufficient! I had the privilege of meeting David yesterday at Austin Salesforce User Group meet. He is an amazing guy, down to earth and knows his stuff. Really happy to meet you. You Rock!!! You are a great guy… I really appreciate your will power and efforts to learn Salesforce. You have have proved it, I give your reference to my students whenever I talk about that nothing is impossible in this world, if you have a strong will pwer and decication. Your Blog Is Amazing, Its very Helpful. I am Rahul, I have learn Salesforce this site and This site is very helpful for me learn salesforce. I want to become a Technical Architect. Please tell me which skills are required for Technical Architect. Thanks so much for the tutorials! My question is related to batch updating existing opportunities to automatically associate all account contacts as roles. I found this trigger in another forum (https://developer.salesforce.com/forums/?id=906F00000008sTAIAY), but my understanding is that triggers only happen when an event happens (create, update, etc). How would I create a class that simply updates all the account opportunities (not really changing any data), which will then cause the above trigger to fire after every update? I’m the CEO of ClosedOpp, the first Salesforce focused PPC agency. I saw your services and believe we should work together. There are a number of ways we can help one another. We are looking for Salesforce thought leaders to write articles for our website, and I’m are interested in writing for yours, if you would like that. There are also advertising and referral partner opportunities as well. We very much compliment each other. If you are at all interested in working together, please feel free to reach out to me directly. Have a great rest of the week! Just want to thank you for putting this site together, it is a valuable resource. David – Thanks for selflessly doing all that you do! The contents in your site is amazing. I am new to Salesforce, I am facing problem in adding value to MultiSelectPickList throgh apex code. Let me Explain My scenario. I have two custom object Test__c and Testing__c. In Test__c i have a text field called Partner_level__c and in Testing__c i have a MultiSelectPicklistField called Pick_List__c. When i enter value at Partner_Level__c at Test__c object that value must add to MultiPicklist in Testing__c . I tried to accomplish above scenario though below trigger. But I am not Finding any proper Method to add new Value to MultiSelectPickList. Please Provide your input on this. Testing__c.Pick_List__c=Testing__c.Pick_List__c + ‘;’ + eachPartnerLevel.Partner_Level__c; //Here i am trying to add new options to multiselectPickList. But i know that its not the proper way to add. Please Provide your input on this. Too much code for me sorry! Try the forums! I am confused in on a query. I need to provide an approval process on individual products saved in an Opportunity. I tried putting in an Approval Process, but it does not show any amount field on Product object. My confusion is when I add three products and one of them has been given exceptional discount, I want that particular product to go for an approval. You want to be on the Opportunity Product object instead! Hi David, Many thanks for your valuable time taken to guide other. I am interested in for Salesforce developer certification, but plz advise? I am not IT field or is it necessary to pass the administor certification before goinig to developer. Go ahead and do developer first =) Not necessary to do admin first! Many thanks for the reply. Can you plz advise the study materials for salesforce developer certification. Even the most complex piece of code can be broken down into statements so small that each statement is simple enough for a child to understand. David, LOVE your website! Have mentioned it at work, as a valuable online resource. At my company, they are planning an innovative program to bring on board recent college grads or interns, with either a background in Computer Science, or even just an interest in learning Salesforce.com, and eventually turning them into SFDC Admins or Developers. Apart from the (useful) links you have posted, i.e. Quizlets, Udacity, are there are any other online training tools that you can recommend for those planning to take the 201, 301 and 401 certification tests? Even those with nominal costs. Thanks! Awesome – check out the first link here! I am Rajesh. I learned from your comment that your company is looking for college grads to work on Salesforce.com. I have completed my masters in comp science and I am actively looking for an opportunity. I am acquring the skills required to be a salesforce developer. I would love to start my carrer as a salesforce developer. If you think, I have a chance, please share your email address or send me an email to my mail id (rchan054@fiu.edu). Thank you. David : You are doing very good job. You are not just sharing the knowledge but inspiring everyone to acheive their goal. Thanks a ton. Dear Ron, I am very interested in your company’s innovative idea. Do you have time to discuss? I am looking forward to hearing back from you! Thank you for everything you have put together on this website. It is really great to have it all combined into one trust-worthy location. I recently took my ADM 201 exam and almost every-time I went to site that offered study information I was skeptical of it being correct. Studying for the exam ended up being more nerve-racking than the exam itself. Anyway, I was hoping you could provide some guidance into the best process for becoming a well-rounded (expert on Salesforce)? With all of the updates, changes, apps, certifications, etc. that Salesforce has to offer how do you know which path to take? My goal is to be as educated about the declarative side SFDC as possible, but know when and how to use Apex when its needed. Am a big fan of you sir, am planing to Dev 401 Certification. Could you please send dumps for Dev 401 certification. This is all you need right here! Thank you David for this wonderful site! I purchased Head First Java and Apex makes so much sense now. I just wanted to say thank you! David, I appreciate very much the great information you are leaving and building. I was using your login to learn and build functional samples in SFDC. However, the login no longer works for the dev. instance you have right here. Any idea why it no longer allows the login/pass you provided? Check out the “Login” link in the bar above, the latest passwords will be there! Firstly i wanted to thank you, as you made up my mind that one can have fun while coding (the way you write the articles just injects the concept to mind). With this inspiration i could learn SFDC and i’m good at admin, apex and triggers but lagging a bit in Visual Force (Hope to see more articles on VF with examples just as u did for triggers). I could successfully clear DEV 401. Thats one side of a coin i.e. my learning of SFDC. I’m working as a manual tester and now wanted to shift to SFDC, I’m doing my part of learning but there is an internal fear keeps on haunting me that will i be able to crack through interviews and get a job as a SFDC developer as i’ve 4 years of exp and how to get a job. Meanwhile i’m planning to do some coding for practice, so if you have any project ideas can u pls share, as i want to have some hands on and real time exposure. You’re on your way Karan!!! David, Could you please lemme know how I can find them. David, could you give me more details of what are they. Having recently stumbled upon Salesforce Administration/Development and upon reading the content on this site, I’m hooked! Thing is, I have no tech background (psych major), and had just started prepping for the Salesforce Admin exam (taking late October). You wrote that the supply has finally caught up with the demand, and it seems that the outlook of this career is looking progressively more grim as the months go on. Although I am interested, I am nervous to deviate from what I am doing now (recruiting) to pursue a career in a market that is saturated with salesforce admins/developers. Thoughts? Also – what types of positions are fairly entry-level, and when should I pursue them? After attaining my first three certs? The market’s still growing, just not as quickly as it was before. The outlook will be much better than the recruiting outlook in the forseeable future, since honestly there are much less barriers to entry to become a recruiter (I work with them a lot)! Entry level dev jobs are always good! Thanks dude. I’ll try to catch you at DreamForce. Just added you on LinkedIn too – keep in touch! Thank you for putting together such an amazing site. I immediately fell in love with it and I can feel your expertise in the material. I am in a similar boat as Jeff – currently in sales with zero coding knowledge and very little Salesforce experience but I have been thinking of a career change to development and after I found this site, Salesforce seemed to be the way to go. Do you still think the window is open? And that there will be continued high demand for SF professionals in the upcoming months/year? I was also considering a coding bootcamp such as Hack Reactor to go into fullstack dev but I def don’t wanna drop that kind of money if I don’t have to. I wonder if someone changed the password to for the login learn@salesforce.com? ; not working today ?? You talk a lot about getting a DEV job. Many of them requires Visualforce development or VF skills. Are you planning to extend your help through visualforce pages? Good question! Yes definitely planning on it! Chapter 8 must be learned beforehand though! I am planning on taking the Dev 401 on October 12, 2014 before Dreamforce. Are there any other material I should review other than the Help & Training videos provided and the Admin fundamentals workbook you stated on your website. Hi David, what is a local dev group you mentioned in your webinar series and how do I find one that’s local to me? Regards. we are celebrating Teachers day in India today. Just wanted to thank you for the effort you have taken to make coding so much easy and fun. Probably my favorite comment of all time. Thank you Amitabh! My goal is to become a salesforce developer or Architect .. Can u guide me which is the best thing for me to start learning the salesforce . Right here, start to finish! Our company is moving towards Salesforce but is not currently active on the platform. Thank you for taking some time to look at and hopefully answer my question, I know your are quite busy. The best way to truly know how you’ll do on the certs is to check out flashcards on Quizlet.com! My company recently implemented SFDC in May ’14. I work in the Sales Ops department and I am a sales admin in SFDC, which basically means admin of anything sales, but nothing service. I would like to become a SFDC developer and have started watching the webinars and going through your beginner tutorials. You mention in one of the webinars that you can’t become a good developer without knowing the point and click side really well. I’m struggling to know when I have the point and click side down enough to focus more on the dev side. Should I be mastering visual workflows for example? Where do visualforce pages/components fit in? Should they be learned before or after triggers? It seems like there is so much to learn… What would you recommend as a learning path? If I was starting from scratch I honestly wouldn’t even touch code for the first six months of Salesforce work. There’s so much you can do without code that you’re only going to confuse yourself. Once you’re good at the admin stuff, it’ll be very obvious when you need to code and when you don’t. To put things in perspective I grill dev candidates on the admin side and more than half of applicants fail because of this. I am following your website daily. Thanks for your efforts on the web to help the people wants the right information. Myself at starting stage of my career. dont have coding skills. i am basically a electronics graduate. Can you please tell me what is Sales Cloud, Service Cloud? Here is my code. Itst 66% with the test. But not sure how to confirm this works. If I create a case, the data does not copy over. So you’re simply coping the SVMXC__Component__c to Serial_Number__c ? Make sure SVMXC__Component__c isn’t empty! Nope but the recordings are all posted here! Love the site and really enjoyed the ‘APEX for Admins’ webinar series – finally something that has helped me wrap my head around it all! At the end you mention that a series on VisualForce is upcoming, are you involved in this too? Where is the link for that? Not my series unfortunately but check up regularly on the official site for details! Man your story is very inspiring, how are you finding time to reply to each and every message. This will happen only if you love what you do. thank you so much for maintaining such a nice webiste. All the very best to you with love, life and career. Iam doing Adv 501 Certification and I finished my multiple choice exam and about to take my programming exam, if you can suggest me wesbites and your posts that will be very helpful. Thanks! You’re right, I got nothing but love for Salesforce, hahaha. – Do not compromise on anything! Basically an object with a relationship to itself! I m new to salesforce.com …. Somehow I found ur website… Its useful … I m about to start practice from ur website ..
How many hours you use to study and practice salesforce when you started and now ? I eat, breathe, and sleep Salesforce =) 10 seconds don’t go by where I don’t think about Salesforce! This is only possible because I enjoy the platform so much, the time and effort doesn’t wear me out! Can you recommend me one or two SOQL books for beginners?. SOQL in general is actually a very small and simple language! I’ve attended both of the Apex sessions and am registered for the third one tomorrow. I have been using Salesforce for several years and have recently begun considering getting certified as an Admin, but I’ve also been encouraged to get certified as a developer as well. Do I need to be certified as an Admin before pursuing developer certification? What would you recommend? Thanks for all that you are doing to help and encourage people. The certs are gonna be a piece of cake for you, both ADM 201 and DEV 401! Heck, the two tests are very similar =) I recommend taking one right after the other! Doesn’t matter which one you do first! Thanks again, David. Your enthusiasm and encouragement are refreshing! hehehe =) You’ll be surprised at how quickly you learn! I am currently a college student studying Information Systems in Los Angeles. I have decided to use my summer vacation time to learn something worthwhile that will help me solidify a job after college as well as guide me towards a stable and fulfilling career in the long run. I have been researching different fields and topics to really dive into and CRM as well as the salesforce platform have popped up a few times in my research. Through some lucky and accidental clicks of the mouse I have stumbled upon your website and I got to say that I love the collaborative/supportive nature of what you are doing, I think its truly awesome! with that said, I was hoping if you or anyone with experience could give me a bit of guidance and information on what opportunities and benefits a young college kid with very little work experience can expect to gain from developing a solid understanding of the salesforce platform, and possibly getting certified in the near future. I am shocked to see a college student with their priorities right! At such a young age!! Keep this up and I guarantee you are going to have a long and successful career! The Salesforce industry right now is unlike any other. There is a perfect storm happening now – huge demand for Salesforce professionals, huge shortage of said professionals, and a ridiculously short learning curve for becoming a professional from scratch. Every year I think the window will close but every year the demand grows and grows and grows. Here is my advice for you young student. Go to my beginner tutorials page and start from chapter 0. Take that free course on introductory Salesforce and find a job at a non-profit that is looking for a Salesforce admin (unpaid). The experience you’ll get at this kind of gig will be invaluable as you look for your first real job after graduating. Thank you for the guidance, I really appreciate it. I am very excited to get started! Thank you again for providing these awesome resources! No problem, work hard Davit! Can you pls give us some exercises on intermediate/advanced triggers that can run on out-of-box salesforce DE. I want to practice more of these but not able to come up with real time scenarios. Also, it’ll be great if you can share some interview questions for developers. I’m looking for salesforce developer jobs. One more question: when we write a test class for a trigger, how do we know the % of code coverage? Most quizzes have a trigger exercise in them that you can run in DE, highly recommend doing them! Sample interview questions coming down the line! Really difficult to predict what someone will ask so it’s best to have a good general mastery of triggers. Very rarely will you get Visualforce related questions. Hi David – it looks like you built your website with WordPress. Please do everyone a favor and install the PayPal Donations plug-in so we can show some gratitude. Your site fills a serious knowledge gap that is not straightforward for most people to figure out on their own. I literally used the same approach that you are teaching others to learn Apex (Heads First, practice, etc), and I find it to be extremely good advice. Keep up the great work! Holy cow what a great comment Tom! I thought about this PayPal thing for a long time tonight. I thought about it while watching Frozen for the fourth time. I am sure the good karma will come back some day! Tell your friends, and thank you for offering at least! hahaha great idea Nitin! You are clearly enjoying your new found coding powers! David – You had me hello, and then your comment here about inspiring people is more important than the cash gives me great respect for you (and humanity!). This is the first site I have found (and I have searched high and low for a very long time), and I just know your tutorials will finally get me over the edge from super admin to super developer. I am so excited to get started – this is going to be my summer project. I have been wanting to do something similar to what you have done but for Admins, and include ability to chat on Google Hangout for Group Therapy sessions to talk about current use cases people are trying to work through and walk through options for building solutions (my big focus is sharing methodology for building good requirements, asking the right questions to the client/business unit to make sure you are thinking through the build in a way that will provide the best product quickly without having to go through a lot of iterations). There are so many ways to do one thing on the amazing Force.com platform and I know it is easy to just pick the first thing that comes to mind instead of really considering the database and report requirements, design, etc. 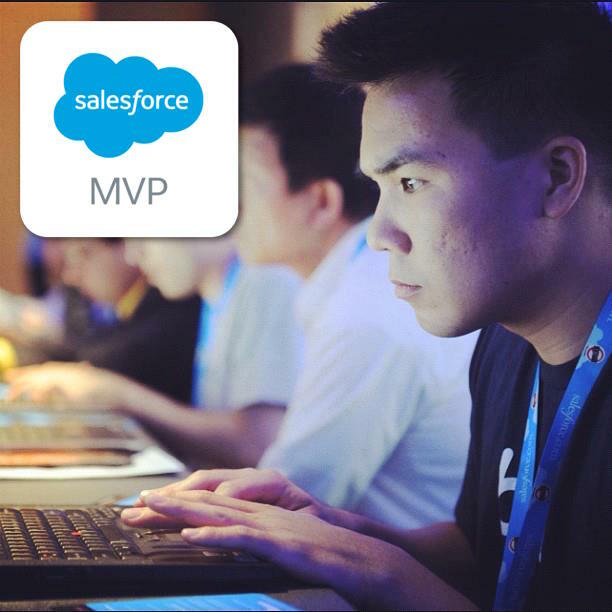 Thanks for your contribution to the community and I hope you would be interesting in partnering up and or help mentor me to become an MVP too one day – I also think about Salesforce every second of the day and am extremely passionate, finally ready to contribute to the community instead of only bringing value to the company I work for :) Thank you!! Wow!!! Thank you for your kind words!! I am going to show them to my fiance later and she’s going to laugh at me, ha ha ha. I was just thinking that there needs to be a site for people to learn the admin side of things – I get so many questions about getting started with that! Thanks for sharing this blog! As a new in IT field i want best advice through the salesforce Architect. I want to open the IT company but my starting strategies are week so please guide me and give me some suggestions. I work with many vendors so I know what people generally look for from IT companies like yours! Raise good children…ha ha…that’s gonna be a tuff one…going to my first salesforce developer conference tomorrow in Boston…thanks for vids and the great site! The conference in Boston is gonna be great, many people put many hours into it – I am very jealous of you! However yesterday I just watched the Disney movie Frozen and it gave me a renewed faith, I love Disney. I am new to this platform,even i don’t have idea about non-coding side of Salesforce also.will you please help me how to be succefull with non-coding side of Salesforce. The very first link on this page will help you a lot! It’s an entire video series on the non-coding side! I’ve been a button click admin for years, but am an absolute beginner when it comes to triggers. I’ve read through your fantastic tutorial and now understand more than ever! Thank you! My question is, when the trigger involves more than one object, how do you determine where to start…i.e which object the trigger should be built on? I was asked to make the Product Name field display on a custom object. The custom object has the part nr pushed in from an integration, but the developers who wrote the integration did not include the product name. (and they’re not around to update). Part numbers are meaningless to most of our users. They want the product name displayed on the custom object next to the part nr. I tried to do this declaratively by creating a relationship between the custom object and Products, but couldn’t make it work and was told the only way to do it was by writing a trigger. Do I start this trigger on the Products object or on the custom object? I know I’ve got a long way to go, but the best way to learn is to dive in, right?! You are 100% right Carol! “Dive In” might be my new favorite phrase! Triggers fire when a record is inserted or edited. So the question for you is, should the logic occur when the Product is created, or when the custom object is created? Sounds to me like the latter would be a better fit, but I could be wrong since I don’t know the exact details of your need! Try to make a tree diagram like this, breaking down every “big” decision into littler and littler decisions until it can’t be broken down anymore. Then, you’ve essentially already written the code and now just need to know the syntax! Great advice! Yes, it needs to occur when the custom object is created. Thanks so much for the link, too. It’s exactly what I need to order my thoughts and diagram each decision! Hahaha, once you get that down, the trigger part is easy! Great job Carol! David…literally stumbled upon your site. Wow! Great work Indeed. Awesome site! You’re really filling a gap for those of us that want to learn Apex but are new to the coding game. Love the concise, straightforward and humorous examples that you give. Keep up the good work! My pleasure John, tell your friends! Thanks for Sharing . It helps a lot to gain knowledge on sales force and i frequently visits this site. I am looking forward for you next article. I am a novice in salesforce. I follow your blog regularly.I have a small question.My scenario was placing an order in a website.There is field called status(pick list values are ‘In progress’,’Initiated’,’Completed’) in my application.As soon i start the process of placing an order (like selecting the item and choosing the shipping method etc)the status should be ‘Initiated’ when i completed my order(placed the order) the status should be changed to ‘completed’.I am guessing we can achieve this using triggers but i am not sure how to do it. can you please help me with this.Give me an brief idea or any sample of code so that i can understand better. You are really doing a great job by helping people like me who are new to salesforce. Otherwise, we can definitely code a trigger for this! Let me know how it goes! You are awesome. I am a Financial Analyst wanting to build Salesforce apps on mobile . Can you please make some video on writing object oriented programming but more practically not like hello world. I love your passion . I am looking to learn code to make calculations by code . Example creating a web tax return form. Object oriented lessons are planned and coming soon after we write an advanced trigger! Glad you like the site Sarvesh! You are rock. You know exactly what a person need from fresh start. Never seen such a valuable site for the beginner. It is really really a great site. I will definately recommend this site to all those who are new to salesforce. How many peoples will get benefits from this site, God knows. GOD BLESS YOU for all your efforts and spending time to make it more and more valuable. I have no words to express my thanks to you. Thank you for the comment Singh, I am very inspired to post even more now!!! It is nice to see the DEV sandbox. I got a inspiration from urside. I am going step by step. It’s really interesting. GOD will bless u for showing the way to all. I am AIX Admin person. I am interested to learn Salesforce. Is it Good for me. I truly believe that anyone can learn Salesforce! Since you have experience administering other systems, you’ll have a big head start with Salesforce too! 2. There are many non-profit organizations looking for people to help administer their org. You’ll work for free but the experience you’ll get is invaluable! I agree with David, you will be way ahead IMO. I am relatively new to Salesforce( less than 1yr exp). Eight months ago I had to google CRM and Salesforce just to see what the heck they were. Then 3 weeks later(after gaining access to premiere support training videos) I was a certified Administrator. A month and a half after that I was a certified developer. The Salesforce/Force.com community is very helpful and there is a never ending supply of resources out there, thanks to awesome people like David. Just watched one of your tutorials (at Bryan Borought’s recommendation) and I’m hooked! I’ve shared your site with the Tampa User Group and I know they will show you some love! I can’t wait to read through and experience the rest of your site. Thank you for being awesome! This is a great COMMUNITY resource! Woohoo!! Thank you Jackie and glad you like the site!! Your tutorials are awesome and for beginners like me they are really very helpful. Can u Please send me your personal mail id ? Awesome website! Keep up the good work brother! This website is perfect! I am going to bookmark it and check it often. I am excited for the existing and future content!! Follow me on Twitter @dvdkliu to get updates on new posts! I look forward to your next post. Thanks for helping the 99%.